Millions of tourists annually visit the largest of Spain’s Canary Islands and no wonder; with its sub-tropical climate, great food, unique beaches and plenty of experiences to keep the whole family entertained – it makes Tenerife a fantastic low cost holiday destination. One of the biggest draws of Tenerife is the vast array of water based activities that are on offer. You can try your hand at zipping, bouncing and splashing about on Jet skis – if you fall off, the bike simply stops to allow you to climb back on. More exhilarating is a jet blaster ride – it will send your adrenaline through the roof! Laughter is guaranteed by hopping aboard a banana boat ride where up to eight people can enjoy the speed, twists and turns as a speedboat drags you across the sea for ten thrilling minutes – all you have to do is hold on! If you are looking for wet and wild experiences suitable for the whole family, Southern Tenerife is where you will find the self-claimed ‘most spectacular water attraction in Europe’ – Siam Park. The breath-taking 52 million euro water park includes Thai theming on all of its rides, park buildings, and restaurants. The mystical paradise has high thrill water rides such as the Dragon and Mekong Rapids, and an adrenaline rush is guaranteed on the Tower of Power. There are toddler friendly areas such as The Lost City and even a dedicated ‘baby zone’. The beautiful scenery is breathtaking, with subtropical plants, Koi Carp pools, a Thai floating market and a lazy river meandering around the whole park. Los Cristianos is the closest holiday resort suitable for the family where there are many child-friendly bars and restaurants, making it an excellent place for evening family entertainment. 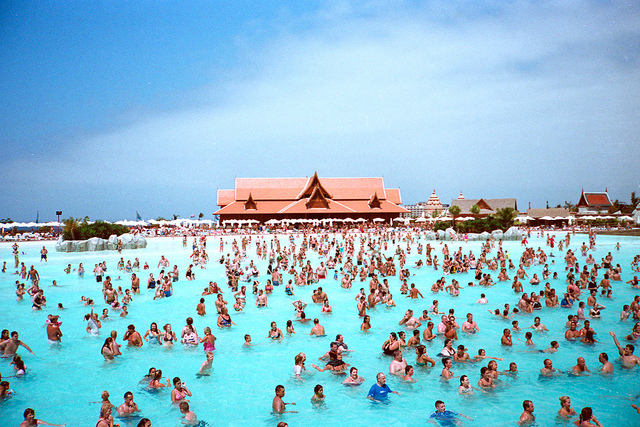 Siam Park really is the best water park in Europe and IMO one of the best in the world. The best rides are the Tower of Power and the Dragon. The wave pool is pretty cool also.